I always find it hard to encapsulate what happens at men’s knitting retreats. Aaron Bush did a good job highlighting what we did and the camaraderie felt last weekend at Easton Mountain Retreat Center. Anyone who attended would probably admit coming away with more than inspiration for a project or a new knitting technique, but the personal impact may be hard to verbalize. Gratitude, communion and a shift in respect for self and others might all be part of it. At the end Jeff Cohen, one of the attendees, passed one of his hand-knitted hats around and asked everyone to touch it. Whenever he knits at home through the year, he said, it lets him feel connected to all of us. Each year the group raises money to provide scholarships for several men who could not otherwise afford to attend. This year for the first time, non-knitters who wanted to learn the craft were actively encouraged to attend and apply for scholarships. My good friend Jaye Crawford received one, went with us and learned how to knit. He was finishing his first hat in the car on the road back to Guelph. We call the new men lambkins. This spirit of community and generosity, passing on both skill and wisdom, has persuaded me to consider planning a men’s knitting retreat here in Ontario sometime in 2014. It would be a considerable personal challenge. My partner, Danny, and I are both strong introverts. Besides that I suffer from anxiety disorder. Some people get panic attacks from flying on a plane or going out in public. Mine are triggered exclusively by social interactions. It is a hangover from being ostracized and leaving a cult-like religious community 18 years ago. Though the roots of my condition go back much further, since then I have felt uncomfortable in groups of people where intimacy is shared (and potentially punished). Isolation is a curse to a boy whose mother raised him to be kind and open-hearted toward others. I enjoyed my first two retreats in 2008 and 2012 but found myself frequently exhausted, jittery, needing to remove myself and spend time alone in the woods. However, I also tasted the fellowship and unconditional love certain religions preach but seldom demonstrate well. Besides that I found myself in the company of others who have perhaps experienced isolation and remain guarded in different ways. Instead of foundering on the sidelines, like I did as a “recovering homosexual” in the evangelical church, we find ourselves in the midst, cherished, teaching workshops, showing off things of beauty we have made with our hands. Soaring a little. This is what society is supposed to do. These retreats have restored my faith in people somewhat: not just a head faith, but an emotional one that frees me to emerge more comfortably from my safe zone, relax, not worry so much about saying the wrong thing or appearing nervous. Danny and I arrived early on Wednesday. It gave us time to wind down from the trip, greet people as they trickled in and participate in an informal field trip before everyone else arrived Thursday evening. I do not recall when the wave of anxiety washed gently as a ripple on the sand. I expected it. It did not displace me. I rode it in good company without the need to walk away or hide my feelings. This year’s gathering brought me a step closer to the active, participative person I was in my youth. I first had the idea of organizing a Canadian men’s knitting retreat after we returned last year, but it dissolved in a sea of other challenges, projects and responsibilities. This year I am determined to keep it afloat. So I begin by putting it forward. 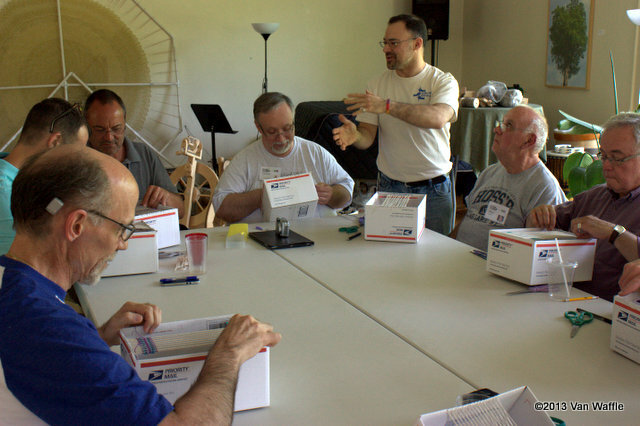 The top photo shows Dave Sledesky, a veteran of the men’s spring knitting retreat, teaching an introductory weaving workshop using cardboard boxes for looms. He suggested to me this is also a great way to weave samples when figuring out how to do larger projects. I would like a simple tool like that for envisioning events. 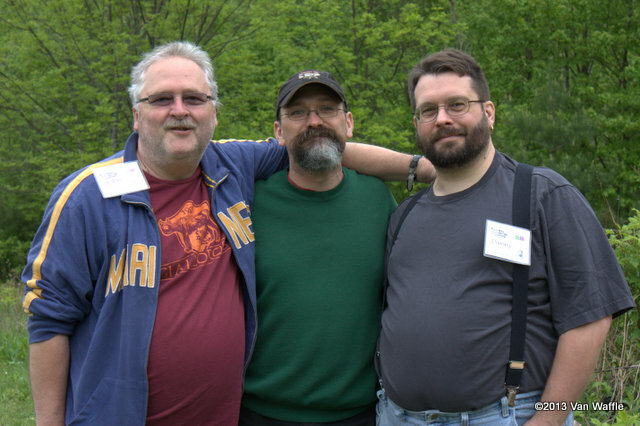 Below is a photo of three friends: John Wise, who I met only last year but it feels like a lifetime, Ron Doughten, a newbie to the East Coast retreat, and Danny Ouellette, my partner of almost 10 years. Special thanks go to Joe Wilcox who has organized the men’s spring knitting retreat so adeptly for six years. I will never match his grace, candour, energy and good humour, but he inspires me to be more at ease in who I am. Jeff, I’m feeling more excited just talking about it and hearing this from you and others. I think you’re right that it can be fairly simple to organize. I have enough ideas for field trips to last five years. I’m actually thinking of Oct. 4, 2014, the weekend ahead of Canadian Thanksgiving. Fall colour is at its peak then. The biggest thing will be finding the right venue. What a beautiful example of your feelings, thought and writing, Van. I hope that I will be able to be included in a Canadian men’s knitting retreat. Consider me an enthusiastic supporter. Thank you, Jack. Your friendly company would add a lot to the gathering. I’m getting more and more excited about this. As you know by now, many of my interests are decidedly non-mainstream: native wildflowers, Ukrainian Easter eggs (traditionally a feminine craft), astrology, Tarot, etc, as well as certain demographics I could potentially identify with. In a city this size, there are social groups for all of them, but most attempts I’ve made to participate, well, I end up on the fringes and don’t feel included. How much of that is my own “baggage,” I don’t know. As for organizing your event, if I can do it, you can. 🙂 From comments so far, seems others have similar faith in you. I used to organize events around local food, a few years before it became trendy. (I burned out on it because people wanted to enjoy it but not help organize it). The hardest part is finding the right venue and reserving it for your group. You’ve got the timeframe in mind and it’s in-advance enough to reserve a setting someplace. Not all gay bears by any means, though there are a few. The group actively encourages diversity. For example, diversity is a factor in the application for scholarships, of which there are two or three every year. Although the majority of participants are 35-60, there are several seniors and several younger men. And while most are gay, there is also a smattering of straight men and trans men. The group also seeks to initiate new knitters, and several attended this year. From what some of the members of these fringe demographics shared with the group, I can tell you they feel just as included as I do. I have a professional hat, comparable to yours, as a journalist. The comfort comes from my education and training, in which I gained experience interviewing people, especially on the phone. Although I would not venture to say I am comfortable with it, I find it exciting and enjoyable when I have this purpose for talking to people, and I an invigorated by the raw energy I feel. I also stammer a little, and I daresay this puts a few people off at first, but I am also good at getting people to talk to me. I suppose this was one of the reasons I wanted to get back into journalism so badly: because I have a sense of capability about my interview skills, and I love telling people’s stories. I have to tell you, I have three Joes who are among the most frequent commenters on my blog. I think of them as knitting retreat coordinator Joe, Easter egg LiveJournal Joe, and Joe-in-Wyoming (also a knitter). I can usually tell you apart by what you say (you in particular seem to drop hints–I don’t know whether it’s deliberate, but it’s helpful). But on several occasions I have been completely flummoxed. It’s strange (but amusing) because I feel some intimacy as friends with you and coordinator Joe. In response to your last sentence, the metaphor that comes to mind is that we are cut from the same cloth, to use a fibre-arts analogy. 🙂 Therefore it’s easy to understand one another or appreciate one another’s way of seeing things. If it would help, I’ll identify myself in the future as I have done above.